Expedition: Famous Explorers is an updated version of two award-winning Wolfgang Kramer games – Wildlife Adventure and Expedition – with a new theme: discovery and exploration. Players lead three expeditions to various locations by placing arrows on a map. When an expedition arrives at a location that matches either a location card held by that player or a public location, that player scores that card by placing it in front of him. 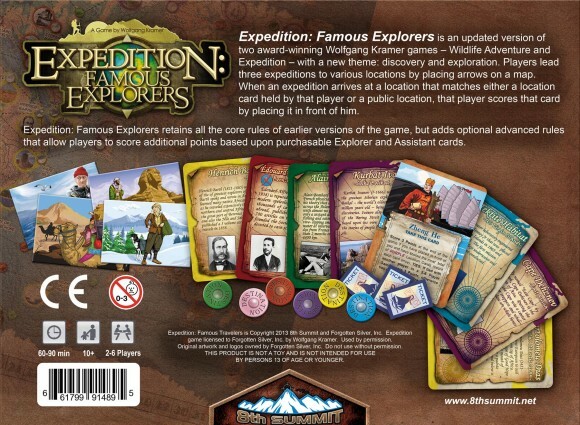 Expedition: Famous Explorers retains all the core rules of earlier versions of the game, but adds optional advanced rules that allow players to score additional points based upon purchasable Explorer and Event cards. Another game mechanism introduces Secret Locations. Add a Review for "Expedition: Famous Explorers"